Udupi, India -- Buddhist antiques of Satavahana period were unearthed at Peruvaje in Dakshina Kannada. The Buddhist relics were found on the slopes of a small hill near Jaladurga temple. 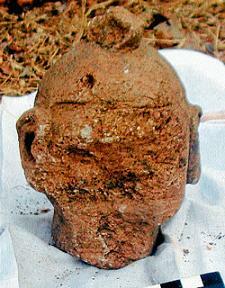 One of the Buddhist antique unearthed at Peruvaje in Dakshina Kannada district.According to a press release issued by M S R S College, Shirva, Department of Ancient History and Archeology Professor T Murugeshi,the antiques consist of a Buddha’s head which is of 12 cms in height and a flake of Bodisatva face which is of 9 cms in width and 9 cms in height. It is made out of soft soap stone (balapa). The face of the Buddha’s head is totally damaged. It has long ears and a small “ushnisha” over the head. These features indicate that the image is of Buddha’s head which dates back to the 7th century AD. The flake of Bodisatva face having lower portion of an ear on right side, right eye is in intact and opened, eye ball shown very prominently within the deep and broad eye cup, a small part of left eye can be visible. It has two cm long nose with broad nostrils and thick smiling lips. From nose to chin it is two cms in length. This clearly indicates the image is proportionately prepared. The release said facial expression, eyes and nose resembles with that of Yaksha image of Igunda and Naga image of Banavasi in North Kanara and human heads of Sannati in Gulbarga, which belongs to Satavahana period. On the basis of iconographical similarity it can be dated back to the second century A.D.
Two bull heads, two headless torsos of the bulls and one bull with the head and another human leg was also found at the site. Anatomical details of the bulls are really marvelous. The bull heads are very beautiful and having projected eye balls as in the case of Bodisatva face and they have striking similarities with that of animal figures found at Sannati of Satavahana period, the release said. The original source of these antiquities is not known. In Jaladurga temple the presiding deity is now worshipped in “linga” form. The temple is renovated. At Tellaru in Karkala taluk, there is a Jaladurga temple wh re the presiding deity is sitting in “Pralambasana” and holding a child on her left lap. This is a dominant feature of the Buddhist goddess Hariti, who is known as a fertility goddess, the release added. Murugeshi says “I got an old record in Peruvaje Guttu house. In that Kannada record different types of gold and silver ornaments are described. Among them ‘Kirita’ is about one and half ‘Seru’ in weight. Two bangles are also mentioned along with other ornaments. This record dates back to 1930.